Following some recent playtesting, my SYW rules have reached a new iteration, which I hereby share with you on the same basis as before: the link will take you to a Mediafire page where you may safely download the rules. Similarly, click on the link to the notes to get some background to the rules and a bit of explanation of where I am coming from. I had conducted a couple of playtests of my own SYW rules using the scenario 'Vanguards Collide' from the pilot issue of The Classic Wargamer's Journal. This is a great little scenario which was fun to play (even solo) and gave the rules a good workout. Looking for something a bit more ambitious for an evening game against a live opponent (well, fairly live: we're talking Paul James after a long day at work) I came up with 'The Battle of Pfaffendorf'. This would be a basic encounter game livened up by making an effort with the terrain, which would represent a river valley across which the armies would fight. The three photos below show how the terrain came together: TSS tiles and hill contours were laid out, which were covered by two Games Workshop battle mats and then dressed with a FoW river and the usual bits and pieces. I decided to lay out the forces in full to save time deploying. My opponent would choose which side to play, or we would dice for sides if he had no preference. I thought this all looked pretty good, for a quick evening game. Overall view and detail of the Line infantry brigade and its guns. So far so good. But the weakness of the scenario was pretty obvious once we started playing. I had allowed for the river to be fordable within the woods and also for a section between the 2 streams, but it was still supposed to be a significant obstacle, taking a whole move to cross without being able to fire. Deployment was also pretty cramped, with little room for manoeuvre. The result, of course, was that a stalemate ensued with a firefight taking place across the water for the whole length of the river from the wooded table edge to Pfaffendorf. Neither side wanted to cross in the face of enemy fire. having driven the Austrians back from the river bank. I had hoped for some manoeuvre on the flanks, where I had given the Austrians an advantage in numbers. 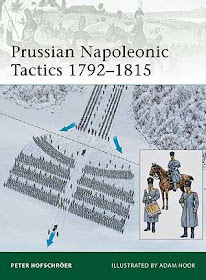 The Prussian left flank was, however, easily closed off by infantry units. Only on the Prussian right flank did some manoeuvring take place, when the weaker Prussian cavalry were predictably destroyed by the much stronger Austrian force, despite flanking fire from the Freikorps battalion. However, even here the flank was easily sealed off by a Prussian grenadier battalion (see below). In the end, both sides reached their breakpoint in the 5th move and the game was drawn. The rules worked well and the battle played out as it might well have done in real life, but there was definitely some sparkle missing. Consulting my copy of Scenarios For All Ages, by those kings of the scenario Grant and Asquith, I quickly found that where a river has to be attacked across in one of their games it costs a bit in movement but nothing else, and is usually fordable for its entire length. Pfaffendorf was inspired by the fictional Battle of Otterlitz in Volume 1 of the Classic Wargamer's Journal, but on closer inspection I found that the river valley in that battle (dating from 1957) was occupied only by a stream, which was easily fordable. Ho-hum. The lessons are obvious. If almost the entire table is divided by a river, make it easy to cross. Or restrict your river to a small section of the table so forces can move around it. And if the table is filled by the opposing armies, give them the ability to get at each other and create gaps that can be exploited. Wargamers like manoeuvre: real battles may have often been a slogging match, but for our fictional wars we appreciate the dashing cavalry charge and the outflanking infantry advance. However, all is not lost. I did like the look of my table when set out, so I will refight Pfaffendorf with the river removed and replaced by a road, and the town moved a little towards the centre to give the cavalry more room. We'll see how that goes. Always on the lookout for terrain items to enhance the table, I chanced upon these Javis walling sections at my local model shop. They only had a couple left so I decided to order a whole box online. Only £10.75, including p+p, for 9 sections, each 140mm long and 22mm high. And they come ready to use, flock and everything. They also come in their own box which you can use for storage. Very old school. Specifically, these are OO gauge Garden Walling from the Javis 'Premier' range, code PW3. Javis only do online ordering for trade customers, but just type in the product name and you'll get 2 or 3 suppliers to choose from in the UK. Here are the walls in action in a recent game, sheltering some Prussian jager. Only joking. I like WI as well. See Phil's 'Classic Wargaming' site if you're one of the remaining few who haven't heard of the project. Best wishes 'til the next post.